In this guest bathroom, time stood still for the last 20 years. What was once a cute red white and blue nautical themed bathroom, now just looked tired and outdated. 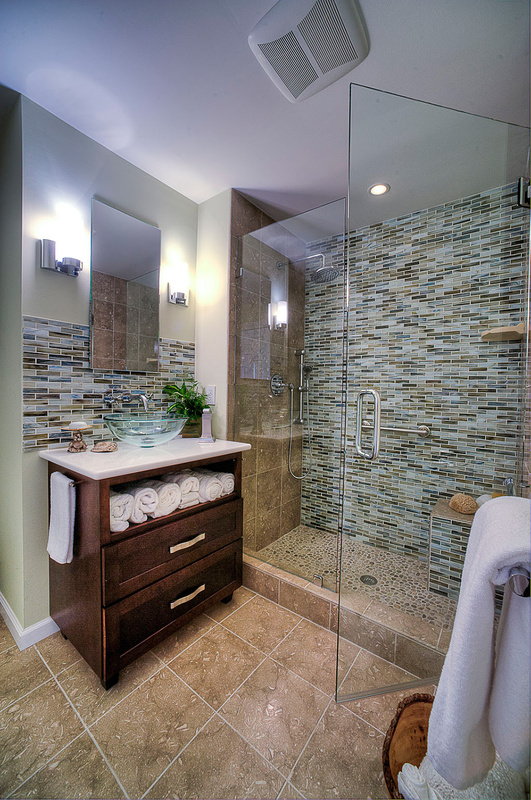 Our clients wanted a modern look with more storage as well as a bath that felt more luxurious and special for occasional guests. They wanted a more clean modern look to the room, one that would reflect their new sense of style. Due to budgetary as well as structural reasons, we could not move any walls or relocate plumbing. So, we had to come up with a great design solution using the same space and layout. 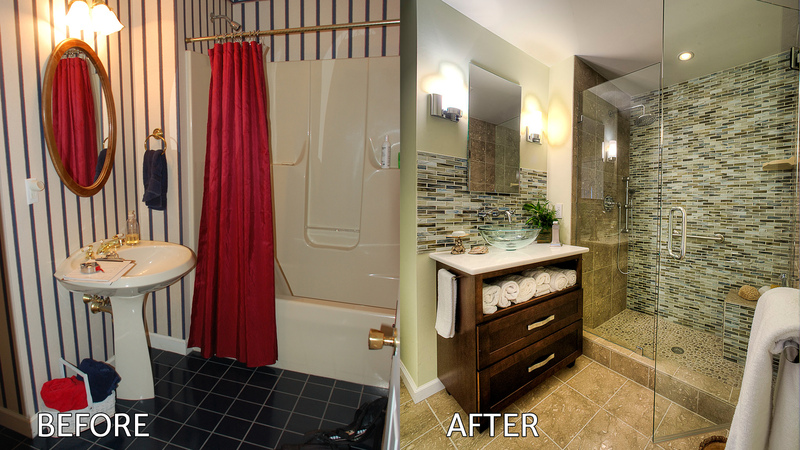 For this guest bath makeover, we chose materials that reflected more of a transitional organic feel. We wanted the space to be light and airy and extremely functional. After consulting with our clients, it was determined that in order to offer a more spacious and luxurious bathing experience, that we would remove the tub and create a large shower in its place. 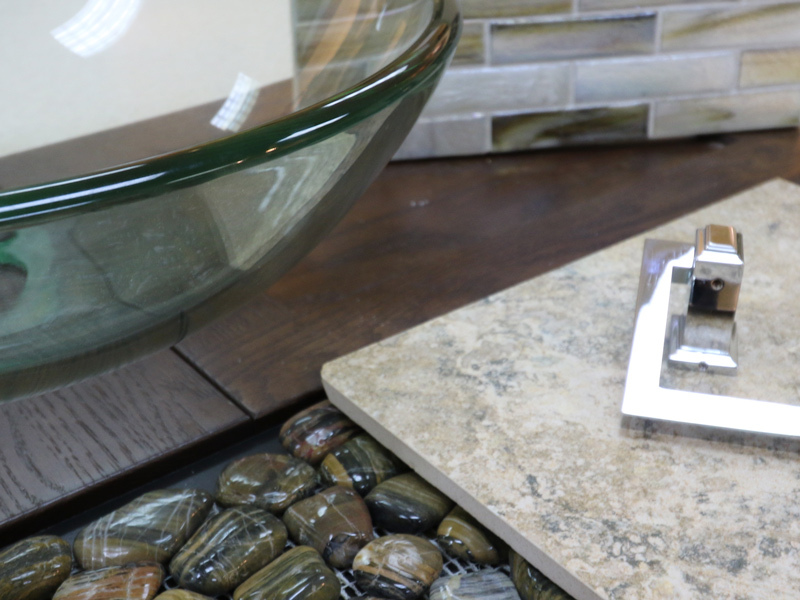 The pedestal sink, which lacked storage, would be replaced by a custom vanity that included storage space as well as much-needed counter space. Since we weren’t able to move the plumbing, we chose to use an updated toilet that included comfort height seating as well as low flush efficiency. For even more storage, we would design a custom cabinet that match the vanity that could be placed in the alcove above the toilet. With our game plan in place, we then set out to select just the right materials to fit the look and style that our clients wanted and yet stay within our budget. Since tile would be a major element in this bathroom remodel, we chose a field tile that was made of porcelain for easy care and maintenance but that had the look of a limestone. And for the shower floor we selected a river pebble stone that not only felt great underfoot, but gave us the organic feel we wanted to achieve. 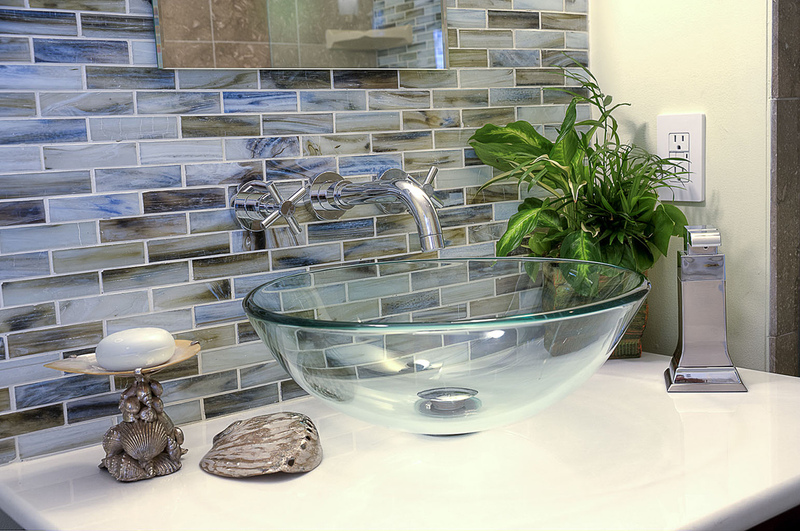 To give this bath remodel the “wow” factor it needed, we covered the entire back wall of our new shower in a beautiful blue and green art glass with hints of beiges and browns to tie in with the pebble floor. To bring warmth and elegance to this bathroom remodel, we chose a dark stain wood for the vanity and top it with a white quartz top. The wall-mounted faucet and clear glass vessel bowl add sophistication to our scheme and provide a bit of drama as well. The clear shower doors allow for an unobstructed view to the shower while keeping this modest size bathroom feeling large and airy. The simple lines of our sconces and mirror play at the simplicity of the glass vessel bowl and add to the spa like feeling of this bathroom makeover. Now our clients have a guest bathroom that is light and airy and thoroughly modern. We created a luxury bathing experience with the large walk in shower, plenty of storage and counter space and filled with elegant and unique materials and fixtures. It is now a bath that any guest would love to relax and spend time in.